You want the best education for your child — an education that equips your pre-primary or primary child with social and learning skills they need for success in both school and life. 1. The teaching staff isn’t certified. To offer a true Montessori environment, a school needs teachers who are well versed in the Montessori method. And since this approach to learning is much different than a traditional education, it isn’t sufficient for teachers to have a degree in teaching. They must have certification in the Montessori approach. At the Primary Montessori Day School, all our pre-primary and primary teachers have a post-graduate Montessori certification from an AMI-, AMS- or MACTE-approved organization. 2. Students don’t interact with younger or older age groups. A vital element of any Montessori education is that it gives children an opportunity to learn directly from older children and to mentor those who are younger. Maria Montessori believed that younger children learn by following the example of older children, something that many parents see in the playtime of their own children. So, a true Montessori school will not offer traditional grades separated by age. Instead, children of different ages will be grouped in one class together, allowing them to interact, help one another and develop social skills. 3. Learning is teacher-directed instead of child-centered. Another unique element of the Montessori style is its embrace of children’s innate curiosity and desire to explore their environment. So, while all the important elements of a solid education — language skills, mathematics, reading and more — are included in the Montessori approach, they are not taught with a teacher at the front of a classroom while students sit in neat rows, taking notes. Instead, a genuine Montessori classroom is designed to allow children to determine their own pace of study. Each child chooses what to work on, while teachers guide and facilitate individual learning. Through this approach, each child can learn at a pace comfortable for them, and they also get the pleasure of discovering truths for themselves rather than being taught by rote. 4. Studies are not hands-on and experiential. In addition to learning at their own pace and choosing their own path of study, children in a Montessori classroom are encouraged to explore. This is especially practical for pre-primary and primary aged children, who benefit from being allowed to move and be active. If you visit a school where all the children are seated at desks for long periods of time, it’s not an authentic Montessori experience. To help children learn through experience, Montessori teachers encourage students to experiment with multi-sensory materials. For example, children may learn to count, add and subtract by manipulating blocks. They write about they are learning, which helps them retain the knowledge as well as improve their language skills. This approach allows abstract concepts to become concrete and thus easier to understand. 5. Children are not developing social skills and ability to care for themselves and their environment. Human beings do not live alone. They are surrounded by other people, a vast diversity of cultures and backgrounds. While traditional classrooms focus mostly on skills and testing, a Montessori school educates the whole child. In a genuine Montessori classroom, you can expect to see children learning not just facts and figures but also social skills, empathy, communication skills, respect for others and more. In addition to developing the ability to positively interact with others, children in a Montessori classroom are encouraged to care for themselves and their environment. They take responsibility for placing their coats in the coatroom or their cubbies. They put away materials after working with them. They learn practical life skills that equip them for success everywhere they go. 6. The school is not a member of the American Montessori Society. Although the Montessori method is distinctly unique, Maria Montessori never trademarked or patented her name or her approach to teaching. As a result, schools may claim to offer a Montessori education while not actually adhering closely to the tenets and techniques that Maria Montessori pioneered. So, how do know if a Montessori school is truly authentic? 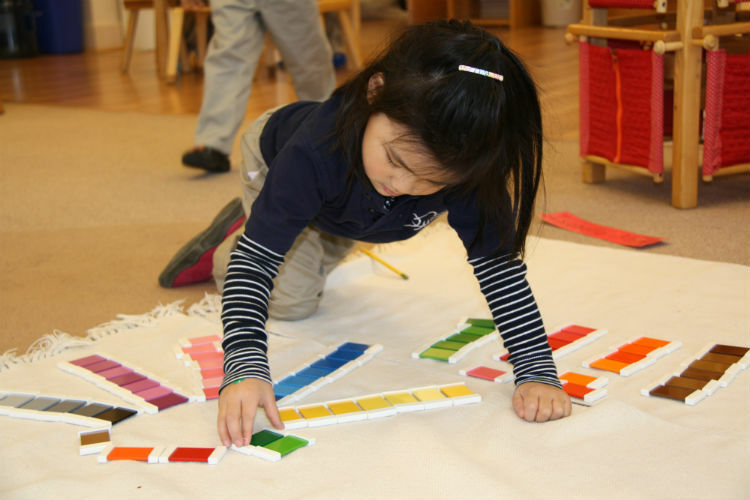 Find out whether or not the school belongs to the American Montessori Society (AMS). The AMS both certifies teachers in the Montessori method and ensures that its member schools uphold the Society’s Code of Ethics and principles of membership, which the AMS stands for. We are a proud member of the AMS, and we work hard to ensure your child gets an authentic Montessori education every moment he or she is in our care. At Primary Montessori Day School, we know it can be an overwhelming process to find the right school for your pre-primary or primary aged child. We know you need flexible schedule, so we’ve created lots of options to accommodate your busy family. Call us today to schedule a tour of our school, so you can begin the process of discovering the benefits of a true Montessori education for your child.